Wardner (ワードナの森, Wardner no Mori?, lit. Forest of Warnder) is a platform style arcade game developed by Toaplan and released by Taito in 1987. In America, the arcade game was released under the title Pyros. The player controls a character by the name of Dover through various forest stages in an attempt to save his kidnapped girlfriend from the evil Wardner. The simple run and jump controls are supplemented with the ability to throw balls of fire. Gold coins can be collected throughout the game and exchanged for extra abilities in a shop at the end of each level. The game was ported to the Famicom Disk System in 1988 in Japan and later the Sega Mega Drive in 1990 as Wardner no Mori Special in Japan and re-branded back to Wardner in the U.S. The Genesis port was never officially released in Europe, even though the arcade game was commonplace in European arcades. 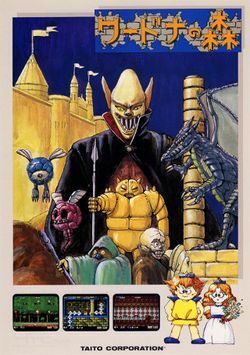 The game was planned, and even official announced for release on the PC Engine before being delayed, then announced for the PC Engine CD-ROM² and Super CD-ROM², until it was ultimately canceled. This page was last edited on 7 June 2012, at 10:09.